Are B Corps replacing unions as standard bearers for worker’s rights? “Unfortunately, Wendy Collie’s tenure was marred by poor decisions that hurt employees, drove down morale in the stores and challenged the very ethos of the grocery chain. In response to workers’ efforts to fight for pay equity, safe staffing levels, affordable healthcare and transparency from management, Wendy chose to hire the same union busting firm as the Trump Hotels and fire workers beloved by customers simply for speaking up. New Seasons responded with a counter statement, which I have posted at the end of this story. The labor dispute represents yet another challenge for the Portland-based grocery chain. But the conflict is also notable for what it suggests about the state of labor and management relations in so-called "new economy" businesses. This category includes many farm-to-table food purveyors, software companies and creative agencies — with leadership that skews progressive and a rack of social and environmentally responsible business certifications to prove it. In the pantheon of socially resonsible business rankings, the B Corp standard is considered the most rigorous and credible. New Seasons Market was the first grocer in the U.S. to become a certified B Corp. Compared to other states, Oregon has one of the highest number of B Corps in the country. So are B Corps replacing unions as standard bearers for worker’s rights? Many B Corps owners and executives say yes. But clearly, many workers disagree. We covered this disconnect a couple of years ago in our article: An Imperfect Union. We interviewed executives working for Oregon B Corps, and found, for the most part, that they place a premium on worker benefits but don't see a role for organized labor. We also solicited the opinion of B Lab, the organization that certifies companies as B Corps. Employee benefits, wages and equity opportunities play a role in B Corp certification, but B Lab is generally agnostic on organized labor, director of standards Dan Osusky told us. The process does include questions that "ensure companies do not prohibit the right to collective bargaining and freedom of association for employees." 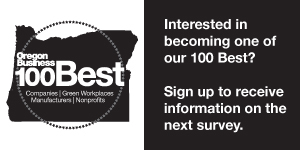 Of the small number of B Corp companies in Oregon we surveyed, Neil Kelly scored the highest on the worker component of the B Lab evaulation. Neil Kelly was the only company in our sample with unionized workers, and its owner, Tom Kelly, was vocal in his support of organized labor. In concert with employee well-being and socially responsible business trends, a growing number of companies are rebranding around progressive workplace policies. But management-labor disputes have hardly gone away. On the contrary, as new business models like B Corps go mainstream — and as industry disruptors continue to put pressure on company bottom lines — expect to see more New Seasons-style conflicts to crop up. "Since its founding in 2000, New Seasons Market has been recognized for progressive employment practices and collaborative team approach. As CEO, Wendy Collie has been committed to supporting our customers, community and staff, emphasizing our "speak-up" culture which gives everyone at New Seasons a voice to share ideas and concerns. *The statement was written by New Seasons Market worker Zoe Dye.